Editors are a fairly recent discovery of mine. They play the indie rock (post-punk , more specifically), but with a twist. They're quite dark and brooding. That makes sense, because they are from Birmingham. I suppose I could say that they sound like Interpol fronted by Ian Curtis of Joy Division. 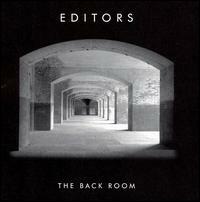 I first heard Editors after a break-up and their lyrics struck a chord in me. "Blood" has this lyric in the chorus, "Blood runs through your veins, / that's where our similarity ends." That's something pretty cold to say to someone. I suppose it summed up some of the vitriol I had for my ex. The cowbell is really cool in this song. It comes in on the 3 & 4 of the first full measure and every other measure during the intro and the verses. It's really atypical of cowbell use in songs.